Famously only 99 steps from the beach, this Laguna Beach hotel is a haven for romantics and a stellar find for families. Orange County, Southern California beaches are known for the miles of golden sand and warm blue waters. Maybe you're here for the Pageant of the Masters. Maybe you're checking out the Sawdust Festival. Maybe you just need to get away from it all and be pampered and spoiled at the best Laguna Beach hotel in the region. This Laguna Beach hotel is surrounded by restaurants, shops and art galleries. We're away from the hustle and bustle of the main beach, so tranquility comes easy. Every room at this Laguna Beach hotel comes with free Wi-Fi, no resort fees, and our famous complimentary hot breakfast. Fill up on sizzling hot eggs, waffles, fresh fruits, pastries, yogurt, cereal, juices and 100% Arabica coffee. Summer festivals include Festival of Arts and Art-A-Fair. The Winter Fantasy comes to life between November and December. Engaging in some beach and water sports are a must. Try your hand at skim boarding, boogie boarding, or simply swimming in the idyllic waters. Surfers and sun worshippers consider this an oasis in paradise. Home to businesses such as Billabong, Oakley, I.C.E. 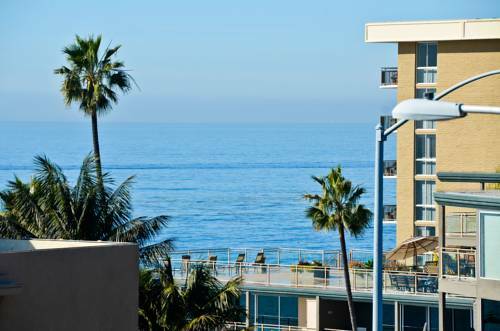 and Burton Snowboards, your Laguna Beach hotel boasts a coastline reminiscent of the French Riviera. This region is famous around the world, thanks to popular shows like, "The OC," and MTV's "Laguna Beach: The Real Orange County." We're located mid-way between L.A. and San Diego and serve as a great home base and centralized location for trips to Universal Studios , Hollywood, Beverly Hills, the San Diego Zoo and Sea World. Just 20 minutes away is Disneyland and Disney's California Adventure. Reserve your room at Best Western Plus Laguna Brisas Hotel and enjoy the view of Catalina! From: San Diego Freeway 405. Take Exit 133, Laguna Canyon Road/Laguna Beach and travel to Pacific Coast Highway. Turn left onto Pacific Coast Highway and continue to travel for approximately 16 blocks south. The Best Western Plus Laguna Brisas Hotel will be on the left side of the street. The cross street is Bluebird Canyon. From: Interstate 5 Freeway. Take Exit 133, Laguna Canyon Road/Laguna Beach and travel to Pacific Coast Highway. Turn left onto Pacific Coast Highway and continue to travel for approximately 16 blocks south. The Best Western Plus Laguna Brisas Hotel will be on the left side of the street. The cross street is Bluebird Canyon. From: South. Traveling north on Pacific Coast Highway, the Best Western Plus Laguna Brisas Hotel will be on the right side just past Agate Street. From: North. Traveling south on Pacific Coast Highway, the Best Western Plus Laguna Brisas Hotel will be on the left side just past Bluebird Canyon Street.